To Stream: Go to a website, like voicesoftexas.com, and click the play button. For iPhones and iPads, use the Podcasts app. You get it from the App Store (it actually comes installed on newer devices). 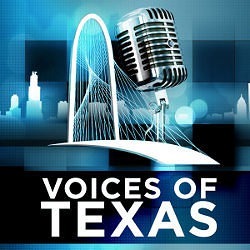 In the Podcasts app you search for Voices of Texas and then hit subscribe. For Android phones and tablets, try the Stitcher app. Get that from Google Play. In Stitcher, search for Voices of Texas and click the plus sign (+), to add it to your Favorites List. Now go to the Favorites List. Tell it to download new episodes by clicking the gear in the upper right corner.